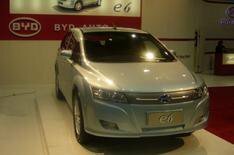 China's BYD wins plug-in race | What Car? The Chevrolet Volt is on display again at the Detroit motor show, drawing admiration for its trend-setting plug-in hybrid technology. Bear in mind, though, that the Volt will not be on sale until late 2010. In contrast, little-known Chinese manufacturers BYD Auto is already selling plug-in hybrids in its homeland - and the base model costs about half the Volt's projected price. BYD which stands for 'Build Your Dreams' - says its small family car-sized F3DM can run in all-electric mode for up to 68 miles on a single charge. A full charge can be achieved from a standard mains socket in eight hours, although a quick-charge to 80% of the battery's capacity can be done in 15 minutes. The car's range is extended by the onboard 66bhp 1.0-litre engine. It is set to be joined in an enlarged model line-up by the large family car-sized F6DM and the e6 five-seater, which the BYD claims will have a range of almost 250 miles. All-electric vehicles are also mooted for 2011. Sure, these cars may not have the impact of the Volt or Toyota's mooted plug-in hybrid, but bear in mind that American billionaire Warren Buffet has recently invested in BYD Auto, and wants the company to start selling its cars in the US by 2011. If it's a success, officials say European sales could be next.